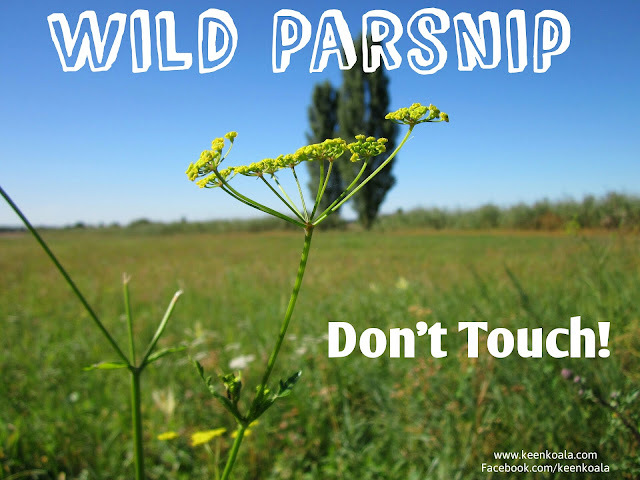 Have you heard of wild parsnip before? Chances are you probably have as it has been talked about in the media recently. Wild Parsnip also known as pastinaca sativa contains compounds found within the liquid in the stems and leaves that can cause burns to the skin when the exposed area comes in contact with the sun's UV rays. It can also damage your eyes if it comes in contact with them. The culprit of these burns can often be difficult to identify as this plant is not as well known as say poison ivy or stinging nettles. 1. Be aware of what this plant looks like so you are able to identify it. Click this link from Invading Species for a handy identification chart that will teach you how to identify wild parsnip. Click HERE. 2. The second most important thing you can do, if you see a plant that you suspect might be wild parsnip, do not touch it and warn others that are in the area as well. And always remember, knowledge is power. The more people who are able to identify this weed, the better. So please share this article with your friends on Facebook by clicking HERE!